Members who do not register online by March 28th will need to pay late registration on-site and are not guaranteed shirt or patch. The Lodge is providing buses with pick-ups at The Council Office and at Camp Elmore. Please indicate if you will be using the bus and which location you prefer to catch the bus. More details on times will be posted shortly. Section Conference is where all seven lodges in Florida meet up at one camp for a weekend of competition, camaraderie, and brotherhood. Over 1,000 Arrowmen join from all over Florida, competing in ceremonies, King’s Cup, and more. There are Lodge vs. Lodge games like tug-o-war and volleyball, and training events as well so Arrowmen can get different outlooks on situations from different lodges. 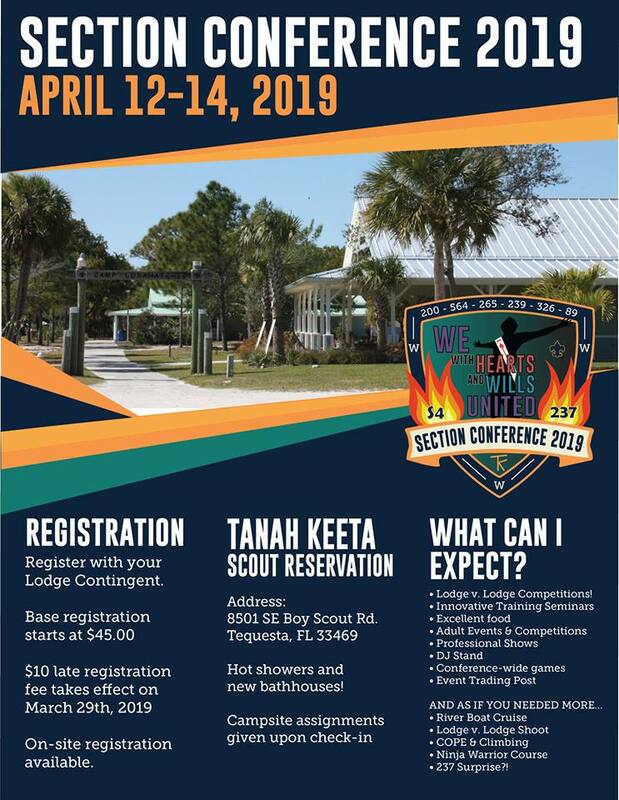 Section Conference is one of the biggest events in the entire region, and this year everyone will gather at Camp TanaKeeta in Tequesta, FL. !